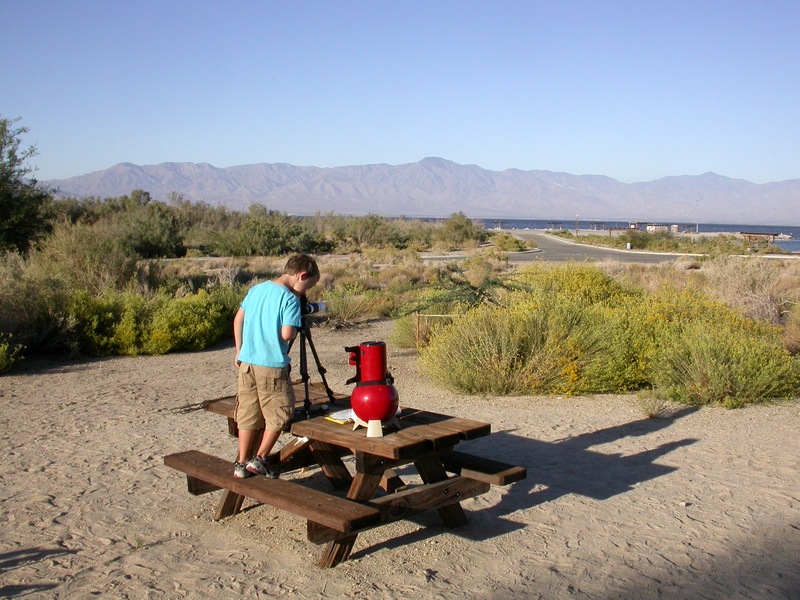 Saturday night London and I met up with David DeLano at the Salton Sea for an evening observing session. In thinking about how to describe it I decided that it was the compleat observing run–and yes, I mean compleat, meaning total or quintessential, not ‘complete’. For one thing, we observed almost every class of object out there: artificial satellites, meteors, the moon, a planet and its moons (Jupiter), a comet (Hergenrother), double stars, asterisms, planetary nebulae (the Ring and the Dumbbell), a supernova remnant (Crab Nebula), bright diffuse nebulae (M42 and M43 in Orion), binocular associations (Alpha Persei Association and Hyades), open star clusters near (Pleiades) and far (M35-38, among many others) and very far (NGC 2158), a very dense open cluster (M11, the Wild Duck cluster), a very sparse globular cluster (M71 in Sagitta), a showpiece globular (M13, the Great Glob in Hercules), a non-Messier glob (NGC 288), Local Group galaxies (M31 and M33) and satellite galaxies (M32 and M110), and at least one non-Messier galaxy (NGC 253, the Silver Coin). Okay, so we didn’t track down any asteroids, terrestrial planets, dark nebulae, Milky Way star clouds, or galaxy clusters. Still, I think we did okay for a sunset-to-midnight run, especially considering we had no fixed plan beyond “hang out and look at stuff”. Also, we used almost every class of common astronomical instrument: naked eyes, binoculars, doublet refractors (David’s Galileoscope and my SV50), a triplet refractor (David’s SW100T), a Newtonian reflector (London’s Astroscan), and a catadioptric scope (my Apex 127 Mak), in apertures from two to five inches and focal ratios from f/4 to f/12. We spent a lot of time just looking up. We used whatever instruments we had to hand, on whatever targets were of interest. We used rich-field scopes on solar system targets and planet killers on the deep sky and located faint nebulae with binoculars. We compared views, compared eyepieces, and compared objects. We found new stuff, checked maps, and got lost–yes, both of us. We explored. We rocked. I did not log any new Herschel 400 objects. I did have a fantastic time. In the future when I am looking forward to an observing run, my standard will be, “I hope it’s as much fun as that one night at the Salton Sea with David”. I’ve done a LOT of observing this month, with two Mount Baldy runs and overnight trips to Joshua Tree, the All-Arizona Star Party, and the Salton Sea. Also, I’ve been fortunate to get to observe with three of the 10MA regulars in that time (David DeLano, Terry Nakazono, and Doug Rennie). Partly I’ve been making up for lost time, since it was too darned hot to go camping before October this year, and I was too busy in previous months anyway. It’s going to wind down now for a bit, though–this coming weekend I’m out of town, and three weekends from now we’ll be celebrating London’s 8th birthday. 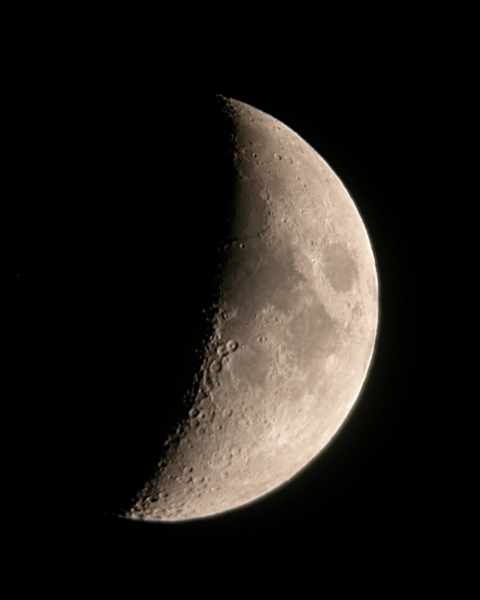 The moon is not nearly as much of a hindrance to deep-sky observing as I used to think. Yes, it gets a lot darker when the moon goes down–David and I were both struck by this Saturday night. But Doug and I swept up a ton of faint fuzzies in binos and in his SkyScanner despite a moon only about three days from full. Two inches of aperture will take you crazy deep under dark skies. By using every trick in the book–fanatical dark-adaptation, staying up past midnight (when most folks turn their house lights off), observing at the zenith, waiting until after a rain had swept the crud out of the skies, and mildly hyperventilating–I was once able to spot M1, the Crab Nebula, from my driveway using my 15×70 binos. At the Salton Sea two nights ago, it was dead easy in direct vision in the 10x50s, and in our 50mm finder scopes. M32 and M110 were also dead easy in the Galileoscope, and more difficult but still doable in the binos, with the difficulty mainly down to lower magnification and therefore smaller image scale. With the right eyepiece, the XT10 is a pretty decent rich-field scope. I got the XT10 back in 2010. It came with a 2″ focuser, but until this summer I had not invested in any 2″ eyepieces; I was loathe to spend any money on an eyepiece that I could only use in one scope. But this summer I caved and bought a 32mm Astro-Tech Titan. With a 70-degree apparent field, it gives a true field of almost two degrees in the XT10–enough to frame the Pleiades, the Double Cluster, the Andromeda Galaxy and both satellites, or the entire sword of Orion. That is an 80% gain in the area of the true field of view over my widest 1.25″ eyepiece. David DeLano also has one for his SW100T and it is a fantastic eyepiece in that scope as well. The 32mm Titan normally runs about $80, and IMHO it’s a steal at that price, but right now it’s on sale for closer to $60. If you have a scope with a 2″ focuser, what are you waiting for? 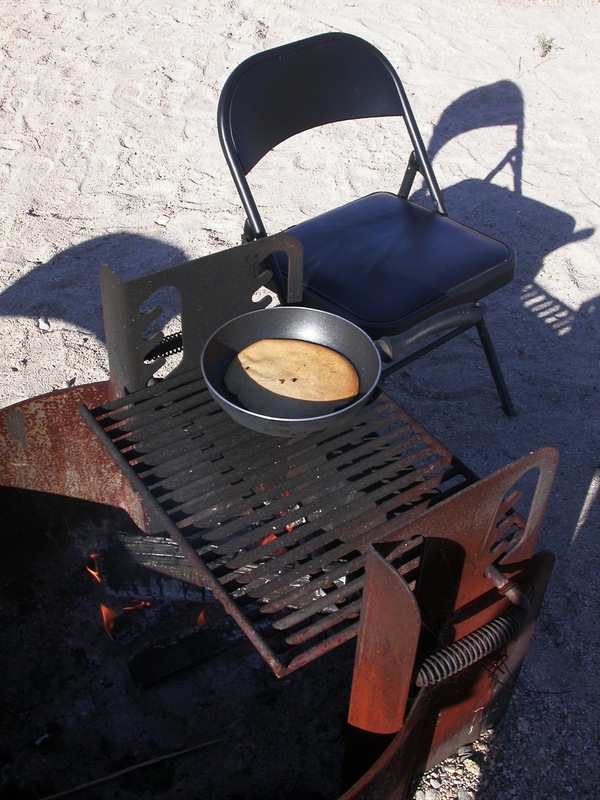 For regular camping, a scope you can pick up and move around is highly desirable. At both Joshua Tree and the Salton Sea, I was happy to have the Apex 127 along, because I could just pick it up and move it to get away from local lights or trees. I will have to keep this in mind in contemplating future scope purchases. I have to admit that I am interested in the Celestron C8 SCT, partly for historical reasons, partly because it is the biggest scope that will ride comfortably on my SkyWatcher AZ4 mount (= Orion VersaGo II), and partly because it is probably the biggest scope I could just pick up and move around without a second thought. I reckon I’ll have the Apex 127 forever, though, even if I get a C8 someday, for the same reason that I’ll keep the XT10 if I get a bigger dob–for what it does, it’s just about perfect. Accessories matter. For the first time ever, I have spent more money on accessories than on scopes this year. This summer I went nuts and bought some nice eyepieces, and I just ordered some tube and finder rings and a dovetail for the Apex 127 and SV50. Observing is a lot easier when stuff Just Works, and most telescopes Just Work better with better accessories–sturdier mounts, better diagonals and eyepieces, more convenient finders, and so on. My interests are changing. I’ve only done a handful of comet sketches, but I’m digging them. I’m getting kinda excited about the idea of sketching deep-sky objects. I’m also getting more interested in trying to understand the 3D structure of what’s out there. Before this past month, I hadn’t done any serious binocular astronomy in over a year, and it’s really been great to get back to that. I have no idea where I’m going yet, but it is probably going to involve a lot more than tracking down the next hundred LTGs*. The most exciting development in the past month? The morning after the All-Arizona Star Party, Jimmy Ray said that London was pointing his Astroscan around with sufficient skill that he could probably earn a certificate at next spring’s All-Arizona Messier Marathon (certificates start at 50 objects). I had not even considered this possibility, but I discussed it with London on the drive home. Actually being able to find stuff with his telescope the past two weekends has been very empowering for him, and he wants to give it a shot, so we’ll probably start practicing in the coming weeks and months. Fingers firmly crossed! Over the weekend, I too left greater Los Angeles to escape the cloudy/Marine layer conditions there and headed out east to Yucca Valley (near Palm Springs) for a couple of nights. Didn’t get as much observing done as I hoped, but it was good to be back at the place where I spent many weekends this past year under the stars. I’m starting to be drawn towards sketching as a way to log my observing sessions and add more pemanence to them. I’d like to be able to recall more details of my time spent with the sky and sketches seem to capture that better than a list of objects observed each night. 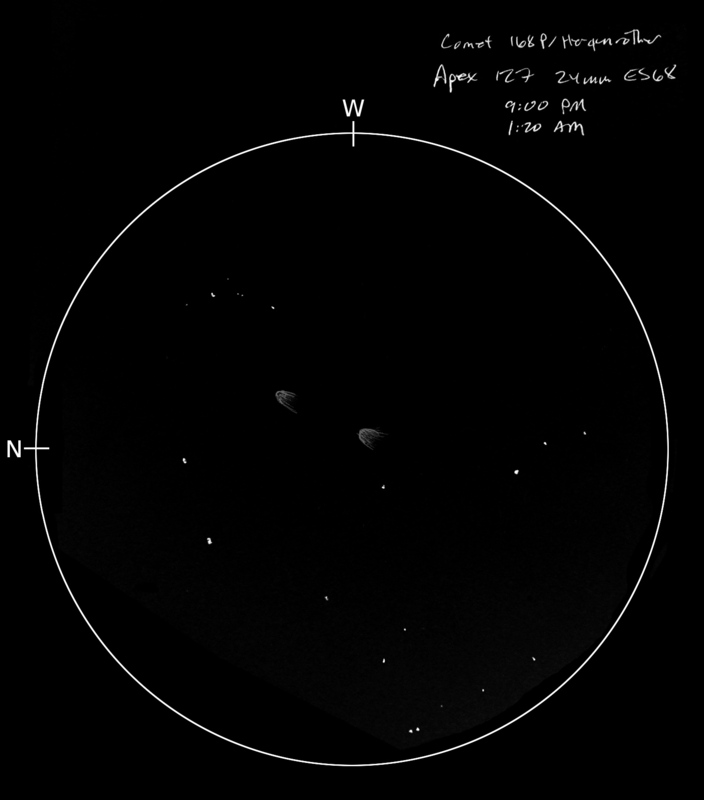 I also think that sketches of the same objects over time will leave a record of improvements in my observing skills. I have to thanks you Matt for the information you gave me about Mt. Baldy. Myself and a friend who is new to observing had a productive and enjoyable night there during the last new moon. I am enjoying your blog. I have to agree with you on two of your points. 2 inches takes you far. I am in Northeast PA its either raining, snowing, or cloudy. I have a 72 mm astro-tech refractor which I love. At my house with light pollution I can make out quite a few things really working hard. The other night I went to my local astronomy clubs dark site which is far from Arizona dark and M31 took up the whole eyepiece it was magnificent. On the dark clear nights when I have had this little guy out it is outstanding what such a small scope can do. You other point of accesories is also well taken. I bought a two inch 70 degree eyepiece and also sprung for a 24mm Televue Pano on sale and the views are just so many steps ahead. I started out with just some basic plossl’s and now I see why just spending a bit more makes a difference. Even the Orion expanse eyepiece in 9mm is great for planets and close up views. Keep up the good work with your posting. Some day I would love to get in really dark skies. and yes, I mean compleat, meaning total or quintessential, not ‘complete’. …That’s not a separate word. It’s just an old spelling. The book The Compleat Angler tried to present the complete set of useful knowledge about angling, and apparently it was successful enough in this that its title got imitated a lot, for instance by The Compleat Cladist, for centuries after spelling had become much less variable. There are native speakers of English out there, often people who spent their childhood reading, who (perhaps similarly) believe that gray and grey are different colo(u)rs. They’re not – the former is the American, the latter the British spelling of one and the same word.